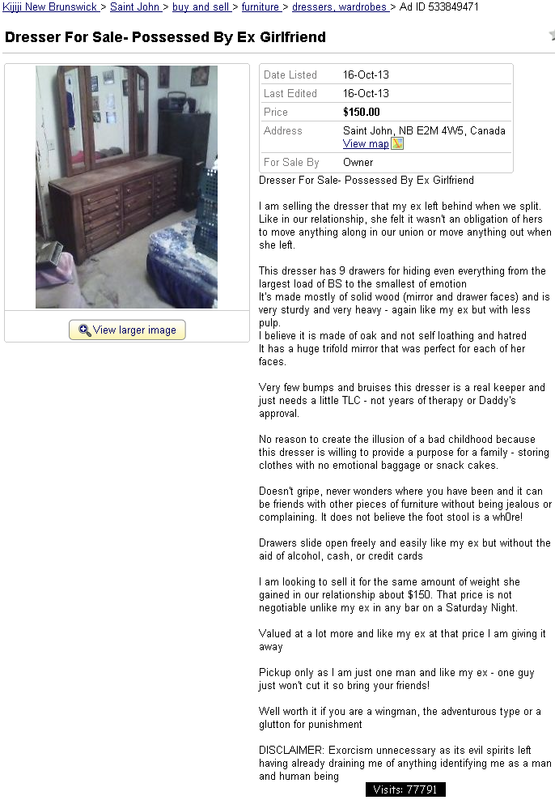 A bazillion hits for this poetic ad about a simple piece of furniture which is inhabited by the spirit of a very complicated woman. 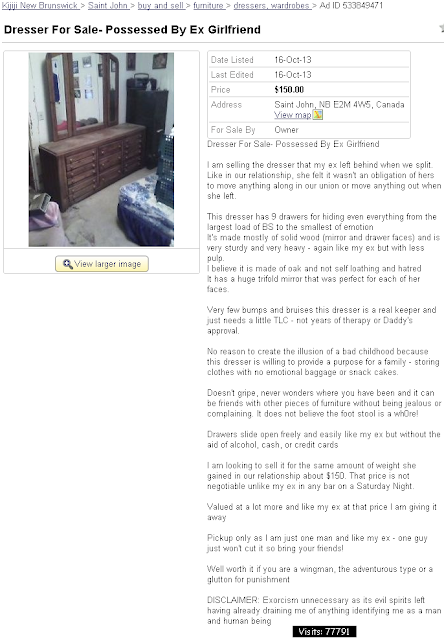 I am selling the dresser that my ex left behind when we split. Like in our relationship, she felt it wasn't an obligation of hers to move anything along in our union or move anything out when she left. It's made mostly of solid wood (mirror and drawer faces) and is very sturdy and very heavy - again like my ex but with less pulp. It has a huge trifold mirror that was perfect for each of her faces. Very few bumps and bruises this dresser is a real keeper and just needs a little TLC - not years of therapy or Daddy's approval. No reason to create the illusion of a bad childhood because this dresser is willing to provide a purpose for a family - storing clothes with no emotional baggage or snack cakes. Doesn't gripe, never wonders where you have been and it can be friends with other pieces of furniture without being jealous or complaining. It does not believe the foot stool is a wh0re! I am looking to sell it for the same amount of weight she gained in our relationship about $150. That price is not negotiable unlike my ex in any bar on a Saturday Night. Pickup only as I am just one man and like my ex - one guy just won't cut it so bring your friends! I think old is gold..